Home / Uncategorised / Pepe signs for City! Adelaide City have signed Chris Pepe in an effort to boost the club’s attacking stocks as they aim to continue their five-game unbeaten run. Pepe spent time in his junior years with the South Australian Sports Institute while enjoying stints with Campbelltown City and Croydon Kings. 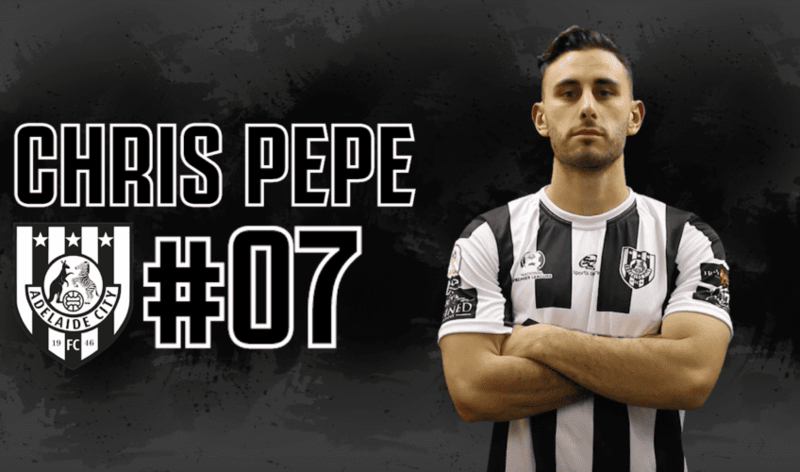 For the past four years, Pepe has been an integral part of the Adelaide Comets set up where he showed that he is one of the league’s most consistent performers over his time with the club. After five games this season, he decided to join the Black and Whites after seeking a fresh change and highlighted the club’s prestige as one of the key factors to his decision. “It’s a very successful club with a huge bunch of motivated individuals.” he said. “For me it’s a great opportunity to play for one of the biggest clubs in South Australia. He also revealed his excitement in his reunion with Joseph Costa, as the two have known each other for a long time. “Joey and I spent a lot of time together in the state system. Pepe claimed that his personal target for the season is to score between five and eight goals per season. But there was an even bigger goal for Pepe – to help the team in their quest for a top six finish and push through the finals and add some new silverware to City’s already rich history.